Intel Galileo board features Intel Quark X1000 SoC with a single core single threaded x86 CPU similar to Pentium. 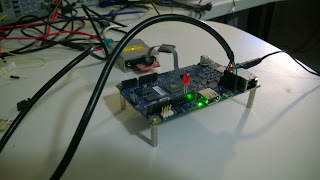 I will show how to build a 3.8.7 version of the Linux kernel for a Linux image iot-devkit-201510010757-mmcblkp0-galileo.direct.xz that can be downloaded from Intel® Galileo Board Downloads under Intel® Galileo Board microSD Card Linux* Operating System Image caption, at the time of writing this was the latest stable OS image build for the board. 1. Get BSPv1.1.0 package from Intel® Quark™ BSP Release Archive or from my GitHub BSPv1.1.0 where it is stored for convinience, you need v1.1.0. Its file name is Board_Support_Package_Sources_for_Intel_Quark_v1.1.0.7z . The newer BSP versions contain bugs and I believe were never used by Intel to build any kernel, for example patch list in BSPv1.2.1.7 doesn't match with the kernel version 3.14 used in upstream.cfg file and gitsetup.py script is missing, though it can be borrowed from an older BSP package it shows that BSPv1.2.1.7 was released without any sanity check. 2. Extract BSPv1.1.0 . Below BSP_DIR must be replaced with a full path to the directory where BSP package was extracted, for example /work/IntelGalileo/BSPv1.1.0/ . 3. Build the tools for cross compilation. Replace BSP_DIR with a path to extracted BSP package. This could take a couple of hours depending on Internet connection and CPUs power. Replace BSP_DIR with a path to extracted BSP package. and copying the file to a building machine. Alternatively the file can be downloaded from my GitHub repository by this link .config . Extract the kernel package. It contains a script to obtain the source code and patches. $ git config –-global user.name "user"
$ git config –-glob al user.email "user@hotmail.com"
Execute gitsetup.py, this will clone and patch the required kernel version from the kernel repository. Set a path for cross-compiler. Replace BSP_DIR with a path to extracted BSP package. The following command will build a kernel and modules. Thanks for the direction for builds. How do we get source code for the BSP. for eg I want to take a look at i2c source code for the galieleo platform.